Are you thinking about using Instagram Stories? Very good! It’s a crucial tool that helps you to significantly increase your online conversion. Nowadays, people watch Instastories more often than normal posts. Moreover, 20% of the Instagram stories lead to a DM from a potential customer. One of the most useful features of Instagram Stories is the swipe-up link. If an account has more than 10,000 followers, you can use this feature to place a URL/swipe-up link in a story. This way you can lead your customers directly to your website. Why do people buy products? Well, one important reason is that friends, family or famous people recommend them. If you work with an influencer, you can easily reach a specific target group and quickly increase your brand & product awareness. The function of Instagram Stories ensures that these potential customers stay online even longer (about half an hour longer than usual), which leads to a higher chance of conversion. Instastories offer many great functionalities. Here are three of the most important ones. As mentioned before, you can use the swipe-up link to lead people directly to your website. We recommend that you place a CTA in a story with a swipe-up link because it may not be clearly visible in combination with a particular photo or video. Do you own a webshop? Great! Did you know you can tag products from your webshop directly in your stories? You can do this by simply uploading a product catalogue into Facebook’s advertising management tool. Instastories also allows you to place ads. You can use a photo, series of photos or a video with a text, and add a link to your Instagram account or website. Instagram Story advertising is linked to Facebook, so you get the same targeting options. With a UTM code you can measure the performance of the URL in the Instagram stories and, if necessary, create a better campaign. You can produce a UTM code easily with the URL builder of Google. Enter your URL and Google will add a UTM code. You may get a very long hyperlink, but you can always shorten it with bit.ly – if you want to place the link somewhere else. 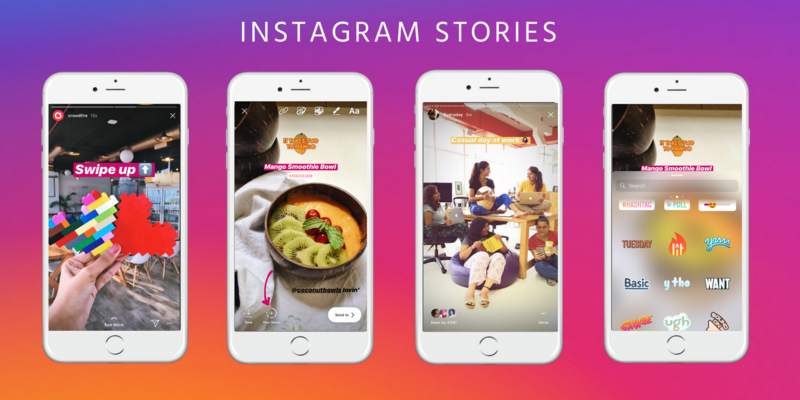 With Instagram stories you can easily reach a specific target group, you can lead people directly to your website, and potential customers can contact you straightaway. If you want to generate conversions with influencer marketing, you definitely need to start using Instagram stories. Do you need some advice on where to start? Request a demo below to get some hands-on advice!